KMC chains are known for their extremely durable and high quality chains that go on all types of bikes, from mountain, road and even track bikes. The KMC X10EPT Eco Proteq 10-SPEED Chain is no exception to the expectations of what KMC has to offer. The double X bridge shape and inner plate chamfering offer some extra smooth and fast shifting. 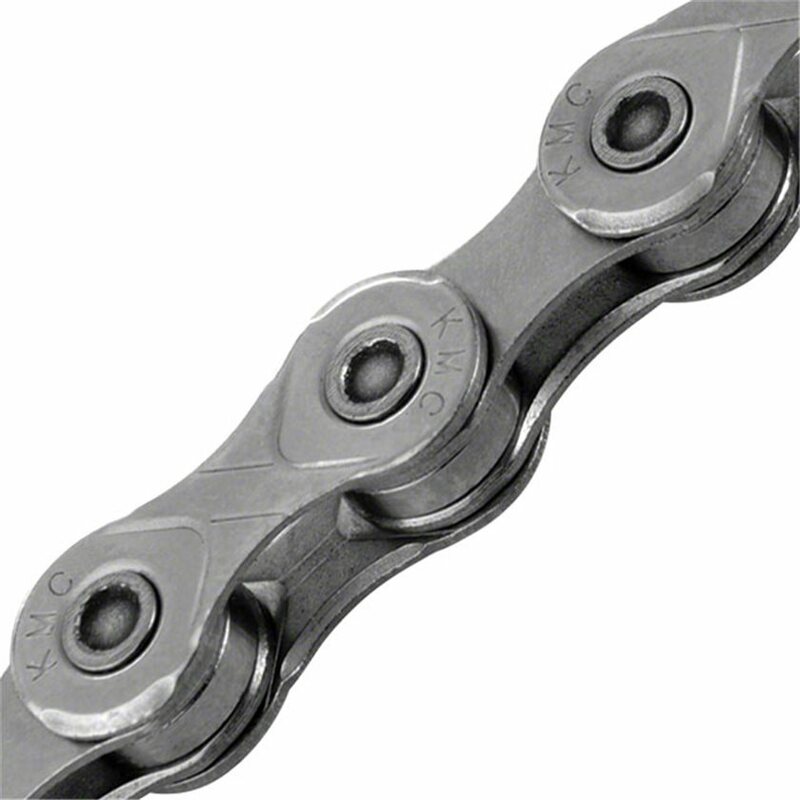 The KMC X10EPT Eco Proteq 10-SPEED Chain is stretch proof, so it's guaranteed to last. Eco ProTeQ treatment doubles the rust resistance compared to KMC's RustBuster treatment. Nothing shifts better or lasts longer than KMC. Never broken one of these, though I've broken many other brands. Durable finish, just as advertised. I've used Shimano, Sram and other KMC chains. I still prefer Shimano on my Shimano spec'd road race bike. However, for my rain bike and mountain bikes, I've found the KMC chains wear significantly longer, they shift better when mucked up and take cleaning and re-lubing better than any other. I gave this Eco Proteq a try for my rain bike (I live in Seattle, it's wet here) and I am VERY impressed with the finish. I've ridden and hung my bike up wet. Other chains rust at the contact points with the cogs. This chain does not. This "rust proof" chain works as advertised. Wear and shifting performance is the best. I have 6 months of rain commuting on my current chain and have since put one on my cross bike. This chain is well worth the money if you ride in wet or muddy conditions or require frequent hose down cleaning. My bike shifts like new again after installing this chain. Decided to give this chain a try on a fat bike that was just built that will see rough weather condition. Working well and has seen 2 snow rides with no issues. What does "stretch proof" mean relative to a non-stretch proof chain? What type of guarantee on this? BEST ANSWER: As you ride your bike the chain stretches over time from use. But this chain was made with stronger metle that will help it last a lot longer then other chains. But all chains will stretch a little bit. But this chain will do it a lot less then other chains on the market. If you are looking for a chain that will last you a lot longer then this is the chain for you to go for. We use this chain a lot and we love how it rides. You will most likely like it to. I have the x10e Ti chain, it the same as this, but this has a different coating (EcoProTeQ coated). My chain did not stretch, but the rollers wore out and as a result caused the chain to behave as if it was streached. Stretch proof or not, finding the proper lubrication for the type of riding you do is a key importance.